AJAX is a fast, user-friendly way to access data from external resources, when that data is available through a web API. In order to make complex web apps, we will probably want information from some of the amazing resources that provide rich, useful data. If you want to integrate maps, social media, live searched images, or any other user controlled data, you're going to want to use an API. 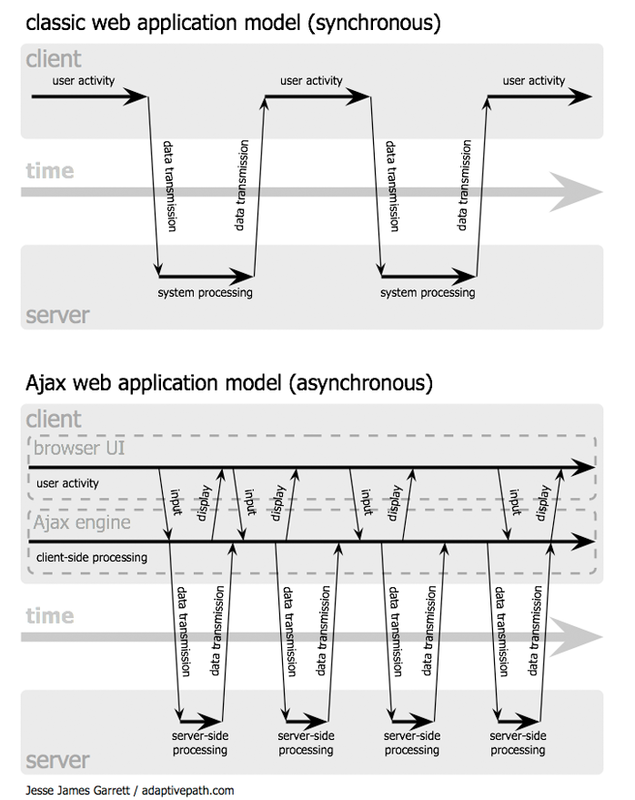 If you want to reduce page refreshes from HTTP requests/reponses, AJAX is the tool for you! Looking at the comments added by JSONViewer, where does this data come from? What search term generated this data? How would you access the fixed height image URL of the first result? An Application Program Interface (API) is the way in which you interact with a piece of software. In other words, it is the interface for an application or a program. Organizations have web APIs to publicly expose parts of their services to the outside world, allowing people to send them queries and receive data (e.g. GitHub API ). Web APIs are the kind of APIs we'll focus on today. When we read the documentation for an API, you can compare it to a contract. The documentation explains how you can interact with an API, and defines how the API will respond to your requests. Food2Fork, Twitter, Spotify, Google Books, Google Maps, WeatherUnderground, Giphy, YouTube, etc. You have to follow the rules set out by the API or GUI. You can make guesses and experiment, but it's easier to start with some documentation. Practice using APIs or GUIs helps you find patterns that carry over to other programs. Follow along as I show you how I'd initially investigate the Spotify API. Check for any restrictions (authorization, API key, wait time for approval, etc.). Pick an endpoint to try (GET routes work best for exploration!). Try to go to that endpoint and inspect some data. What format of data does this API return? How would you access the data that you're interested in? For example, for Giphy, the gif data that we're interested in is located in the data array. Does this API require an API key? Can you view an API endpoint url in your browser? Do it! Asynchronous - not happening at the same time. Some of your code will be executed at a later time. Specifically, a callback will run when you get the results of your request - even if takes a while. This waiting time won't hold up the performance of the rest of your page. XML - a format for structuring data so that it can be sent and received across the web. XML has mostly been replaced by JSON, and AJAX can be used with either JSON or XML. In the past, requests had a "synchronous" workflow, where the user had to wait for the request to come back before anything else could happen on the page. Synchronous requests also require the page to reload. AJAX lets us exchange data with the server behind the scenes. When a change is made on the client, we can use AJAX to send a request and notify the server of what just happened. This is an important way to maintain state between a client and a server that communicate in HTTP, an inherently stateless protocol. Limiting page reloads makes our web apps feel faster and mostly gives our users a better experience. Imagine if you experienced a full page refresh every time you "liked" a post on Facebook.... The requests we've made so far have been synchronous. AJAX is the doorman! It knows what requests are out and what to do when they return. The code (hotel) can keep operating without waiting for a single request (guest) to complete. How do we use AJAX? jQuery gives us several methods for making AJAX requests. We're going to stick to using the $.ajax() method available here. The HTTP protocol was designed specifically for web browsers and servers to communicate with each other in a request/response cycle. A browser will use GET to indicate it would like to receive a specific web page or resource from a server. A browser will use POST to indicate it would like to send some data to a server. 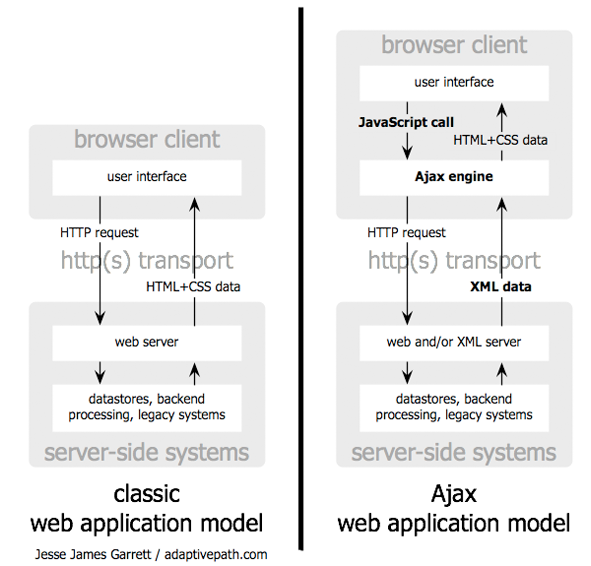 Conveniently, we can use AJAX to make both GET and POST requests to servers. From the perspective of the server, it is just another request. jQuery gives us the $.ajax() method, which will allow us to perform any AJAX request. // if the request succeeds. // response is passed to the function as an argument. For a POST request, we can also use the $.ajax() method, but this time, the request type is "POST". Since POST requests send data to a server, we also need to send an object or string for data (the bookData in the example below). We can combine AJAX calls with any jQuery event handlers. You may want to execute an AJAX call when the user clicks and button or submits a form. Often, we'll need to send data to an API in order for it to process our requests. For example, the Giphy API requires a q query paramater for the search endpoint. You've seen that we can include a data key in a $.ajax() call. When searching Giphy with $.ajax(), we could use an object or a string to indicate the value of q. As long as the form <input> fields have the proper name attribute (in this case, q), serialize() will make our perfect object! When everything goes well, we'll get a response with an HTTP status in the 200s. The $.ajax function checks this status to see if the request was sucessful. If the status is in the 200s, it runs the success callback. Refine the skills covered in this workshop with this Giphy API training. For a solution including the bonus checkout the solution-more branch or find it here on GitHub. APIs open an entire world of more complex projects! All you need to access them is an understanding of HTTP. Now, though, you can access them using AJAX for a smoother, faster user experience. The syntax of the $.ajax() function is complicated, but more practice will familiarize you with its uses and complexity. Check in on whether you can explain method:, url:, and success: without any outside resources. Later, we'll be working with APIs that we can POST data to and update data in databases.